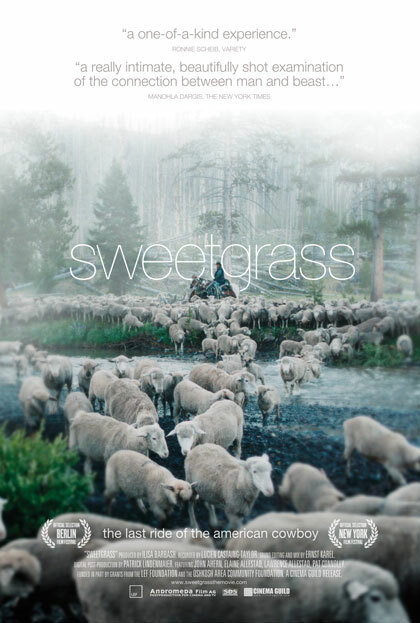 At the beginning of “Sweetgrass,” there’s a shot of a sheep, his face in close-up, determinedly chewing his food. This goes on. No cut-aways, just a sheep chewing. And it goes on. Then the sheep slowly turns his head, stops chewing and fixes the camera with a curious stare, as though freshly discovering this voyeuristic onlooker — and none too happy about being observed. That goes on for a while, too, and then the movie finally cuts to something else. This is a movie? Yes. This is “Sweetgrass,” a contemplative documentary about a sheep herd and the people who drive it across Montana’s grassy lands. If you don’t think the close-up of the chewing sheep sounds interesting (or hilariously funny, which it is), “Sweetgrass” might not be the film for you. If, however, you can zone into the sights of masses of sheep crawling over hills or cowboys hunkered down on horses as rain falls, then this film might exert a nearly Zen-like draw. It’s also a document of a great American trade, now vanishing: the practice of driving livestock across large swathes of the West — in this case, Montana’s Beartooth Mountains. In fact, although we’re not told this until the end of the film, what we’re seeing is the last drive for a particular family, taking their herd over grazing land just north of Yellowstone; the patriarch is John Ahern, a hard-smoking, hard-coughing throwback to another era. “Sweetgrass” doesn’t interview the cowboys or provide narration. It simply observes the drive, in exacting nature: We become attuned to the sounds of the sheep (again, hilarious), the weather, a marauding bear that strikes the herd at night. At times the sheer vexation of dealing with a few thousand ungovernable sheep becomes too much for cowpoke Pat Connolly, who is younger than Ahern but no longer young. He has a meltdown after the herd strays one day, calling his mother on his cell phone, near tears, to vent his frustration with his career choice. That sight — a man shouting into his cell phone, standing on an outcropping surrounded by the wild beauty of the Montana hills (he actually notes that the job is so hard he sometimes forgets to notice how beautiful the place is) — instantly joins the list of great Western images in movies. And it measures the distance of how much things have changed in 150 years of imagining the West. “Sweetgrass” was made over the course of a few years by Ilisa Barbash and Lucien Castaing-Taylor, who had the sense not to look for forced drama beyond the basic shape of the actual drive. After the initial sheep-raising and shearing scenes, we simply give over to the rhythms of the journey. The results are a record of a wonderfully American kind of work and an unexpectedly mesmerizing viewing experience. ROBERT HORTON. March 26, 2010. The Washington Herald.